Over 30 attendees from a variety of employers, postsecondary institutions, and state and nonprofit organizations attended last week’s MAGMA Advisory Council meeting. The MAGMA Advisory Council convenes quarterly meetings for stakeholders in mobility to network and hear from industry experts on addressing talent to meet the demands of a rapidly changing mobility industry. 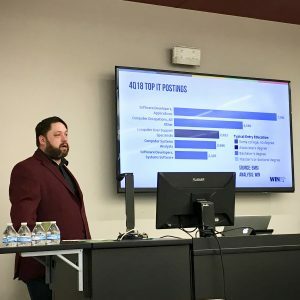 The Workforce Intelligence Network’s David Palmer presented data from WIN’s newly-released Q4 labor market report, which showed increased employer demand in the MAGMA-related occupation groups of engineering and design, IT, and skilled trades & technicians. Other new information presented included the just-launched MAGMA website with a refreshed look and content and integrated membership and e-commerce capabilities – the underpinnings of MAGMA’s transition to a membership-based model. The new MAGMA website content will contain clear language with a value proposition and mission statements, as well as member profile pages, a membership directory, and downloadable content from past advisory council meetings, all available to advisory council members. Meeting attendees also heard from Carolina de Arriba, HR Director, and Kavita Phadke, Director of Learning & Development, from Robert Bosch LLC, who spoke to the biggest shifts in mobility (connected and autonomous vehicles, electric vehicles, and shared mobility services) and the talent changes needed to implement those shifts successfully. Both leaders shared Bosch’s most-sought new competencies and strategies they were implementing in talent acquisition, talent development, and leadership development to cultivate those competencies. Attendees also engaged in group discussions about their respective organizations’ strategies in these areas, revealing much overlap between different employers’ changing strategies to meet the demands of the new mobility industry. 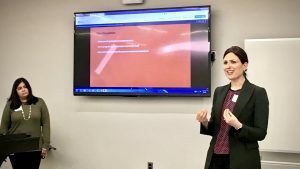 Many echoed the importance of MAGMA in providing a neutral platform that brings together employers and other mobility stakeholders to brainstorm, share, and implement such talent strategies collectively. Copyright © 2019 Michigan Alliance for Greater Mobility Advancement. All rights reserved.